Photo folder named "WalkinClosetData" will be created and saved will be saved to all. Photo Removal do not need, please go directly from the gallery. Then, when you search in the app, so you can retrieve the data corresponding to the deleted photo, you can delete it. Displays all the items such as clothes that you have registered. Displays all the photos coordinating a combination of items. To display the calendar, you can view and coordination by the item. When you touch, you can see everything that has been registered on that day. You can search for items in the tag. Select items from the gallery to change the registration of new items, that you have registered. You have written about this application program. Will display the selected language. Will be different from those tags. 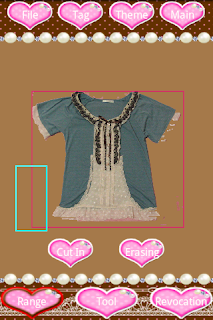 Can be coordinated(main) from the screen, you can freely view the item, and to coordinate. Coordinated photos, you can leave to record the synthesis. Displays choose a photo from the gallery. Item, it is possible to open up to 10 at the same time. Displays a list of search from the tag, the item that you have registered. In a place to search without specifying a tag, all the registered item is displayed. By choosing a tag of "SOME", and also coordinated photos will be displayed. 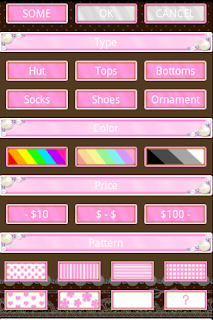 Hides all the items on the screen. Arrange the items that are displayed from the top left. You can hide the selected item. Best to secure it to the back, the item you have selected. Will display the "release" in the state are fixed, When you touch, will return to the original. To change the background color and the button. Visibility of the figure in the middle of the screen is switched. Coordinates from the screen, navigate to the Edit Item screen. 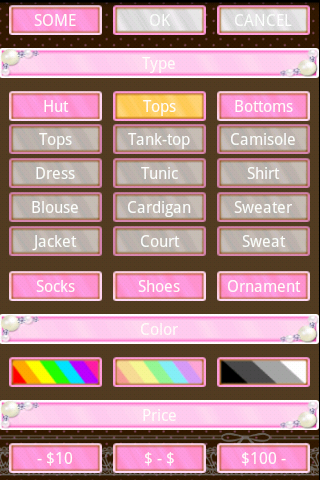 If you have selected the item, it will be displayed in the edit screen. Go to the (Quick Menu) title screen. You can adjust the angle and brightness of the background removed. You can also tag for the search. When you remove the background, will be finished pretty coordinated. Even without having to remove cleanly, so easily Kiridaseru from a selection, it is useful to cut just up and down. Because only one open at the same time, let's save before opening the new. To save the edited photo. Are saved at the same time also the size of the tag and photos. The size is used when calling from the screen coordinates. Can not be used must be placed at least once to save. Go to the screen to tag. 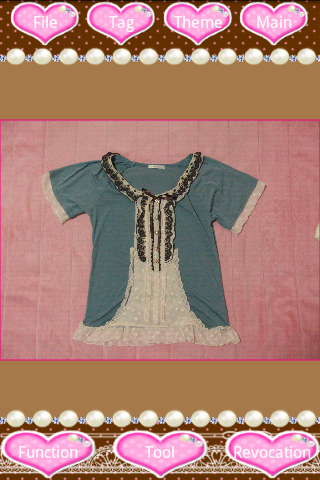 For more information, please refer to the item the tag below. Go to the screen coordinates from the edit screen. If you came to the edit screen select the item from the screen coordinates are returned in a state even if you do not save, edit have been incorporated. In that case, you will return to the original would close once, if you want to keep those that you edit, please save it. Select the range, you can clear-cut. After selecting the range, you can touch the inside moves while that is possible. And selection can be canceled by touching the outside. You can adjust the angle of the photo. Axis to the center of the photo, you can rotate by sliding from side to side. Will be displayed after the slide or decide to change, and release the touch. Bar to change the brightness and contrast two types of photo is displayed. Bar to compensate for the color of the photo will be displayed three types of red, blue and green. Rectangular frame is displayed on the touch a little, that part will be erased. First of all, when you move from part I do not need to touch, you can also erase the details. You can choose the size of four levels. Clears partially, a color close to the location that you touch. Clears from the entire photo, a color close to the location that you touch. Acceptable range of colors can be chosen in four stages. Replace the step 1, edit. Back up to stage 9 is possible. Stage 1 and begin again, it was returned to the original. It is a screen tagging and tag search. Display will change to "search" and "registered" on the top center button. "Type" "Color""Price", when you touch, the tag will be displayed further details. By sliding up and down the touch, you can see all the tags. Tag of a "SOME" is, to what was saved in screen coordinates, but with automatically, it is also possible to release from the edit screen. It is also possible to attach other items. This tag is also used for "See coordination" quick search of the title screen.